We all remember where we were and what we were doing on September 11, 2001. For me I was in 6th grade sitting in French class. The principal made an announcement to the whole school briefly saying what had happened. 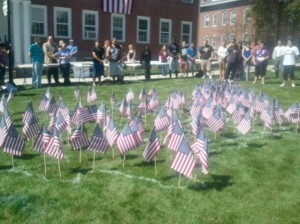 Our class decided on having a moment of silence at that very moment. During the rest of the day most teachers had the TV in the classroom on so they would know what was going on, it got to the point they had to turn the TVs off to not worry the students and to try keeping everyone on task. I remember some kids in my class being worried but our teachers did a good job at keeping everyone calm. What had happened hadn’t fully sunk in for me until I got home and watched the news with my mom. 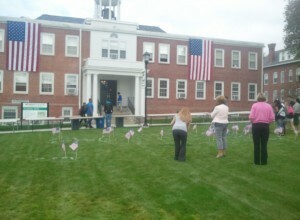 Throughout the morning on Friday September 9, 2011 Nichols students, faculty and staff were handed American flags outside of Davis and Academy Halls. Then they could make their way to a map of the United States which had been painted on the campus green in front of Academy. Everyone was encouraged to place their flag somewhere in the map that was meaningful to them whether it was where they are from or just somewhere they want to go. The map started to fill up as people gathered around some taking pictures, some observing and some sharing with friends where they were ten years ago. 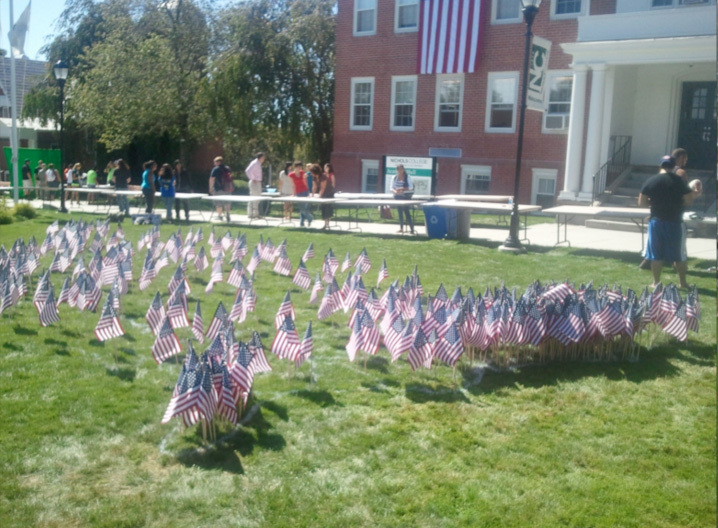 The other part of the day on Friday was the short ceremony that took place also on the campus green that afternoon. Many were gathered outside as the bells from Academy started to ring out. 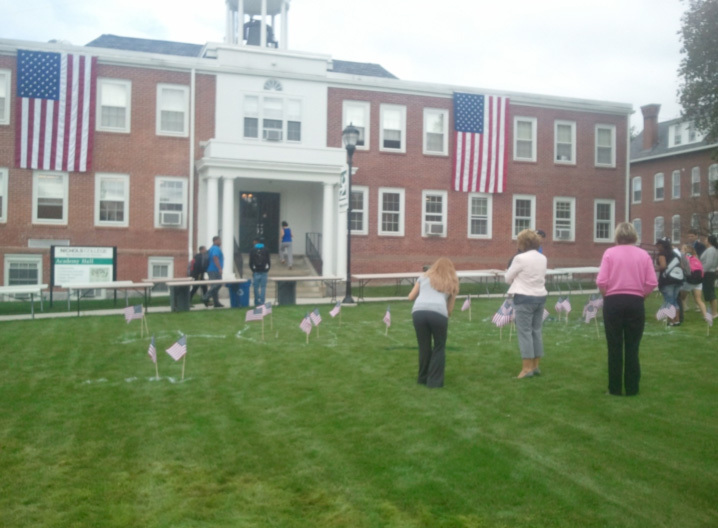 Everyone who was outside taking part in the various activities stopped and gathered in silence around the map full of flags. 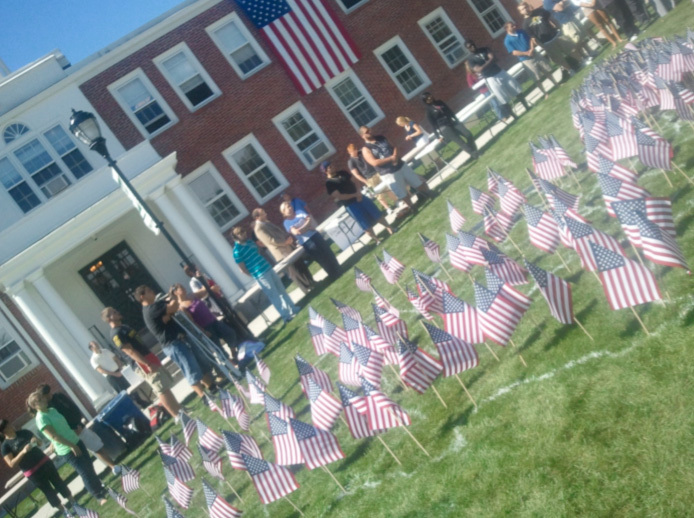 The ceremony started with a short speech from Senior class president Andrew Gresenz, who also organized the event. Andrew then led everyone in a moment of silence. He then handed things over to Ed Baia, Student Government President, for a poem reading. Sophomore Carina Walker rounded things out with a touching rendition of the National Anthem there were chills running through people as they stood reflecting back to that day. 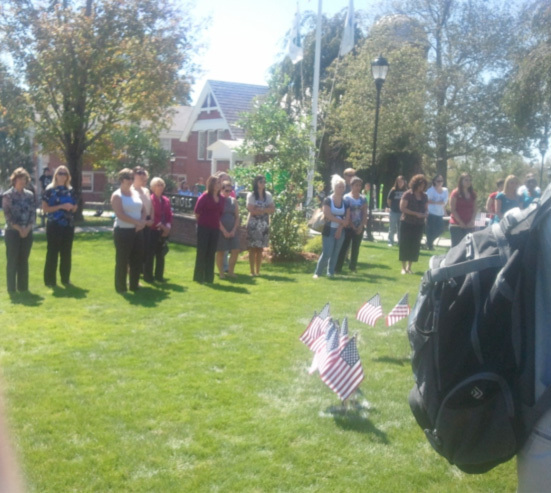 The ceremony was brief but very meaningful, touching all who attended. Also, a shout out to Andrew for putting it all together, giving us all a moment to reflect.